New Zealand's South Island offers not just classic Kiwi-style trout stalking on famous rivers, but even more remote challenges in places like Fiordland National Park. Lisa Weber photo. New Zealand guide Greg Dougherty holds a Clutha River brown taken by Clay Stauffer on his first day of fly fishing down under. Clay Stauffer photo. 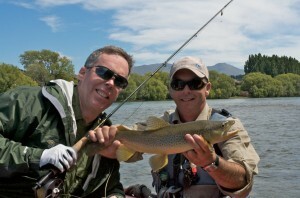 Robert Tomes and guide Greg Dougherty discuss strategy before wade fishing a run on New Zealand's Clutha River. Clay Stauffer photo. 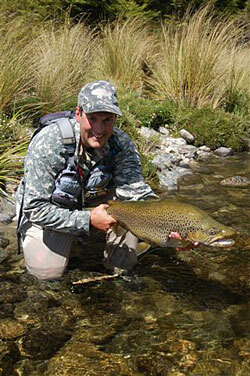 Fiordland guide Lawton Weber with a monster brown taken on a dry during New Zealand's famed "mouse hatch." Lisa Weber photo. My second challenge of this trip was a little more daunting: finding a good resource for fishing the still partially unexplored waters of the region known as Fiordland National Park. Located in the extreme southwest corner of the South Island, near the town of Te Anau, this majestic, fiord-filled, temperate rainforest is as close as you’ll ever come to a real life “Jurassic Park” (my last trip there I’m sure I saw a Velociraptor stalking me along the shore). The main attraction here, however, is not extinct species but very real and very large trout that have rarely seen a fly, much less an angler. I’d dreamed of returning many times but finding a guide who knew the water was different matter all together given the massive area — nearly 8,000 square miles — and ever-changing weather and river conditions. As luck would have it, my contacts throughout New Zealand put me in touch with peripatetic guide and Fiordland expertLawton Weber. For the past 12 years Lawton has had the enviable job of guiding anglers in both Vermont and New Zealand, where he spends all winter chasing big trout around the lower South Island. His name may be familiar to some, as he was the first to discover the dreaded didymo (aka “rock snot”) outbreak in the U.S. when he stumbled upon it on the Upper Connecticut River back in 2007. This bad news, along with evidence of infestations in other rivers across the country, is what initially prompted the move towards rubber-soled wading boots which are now required by law in New Zealand. 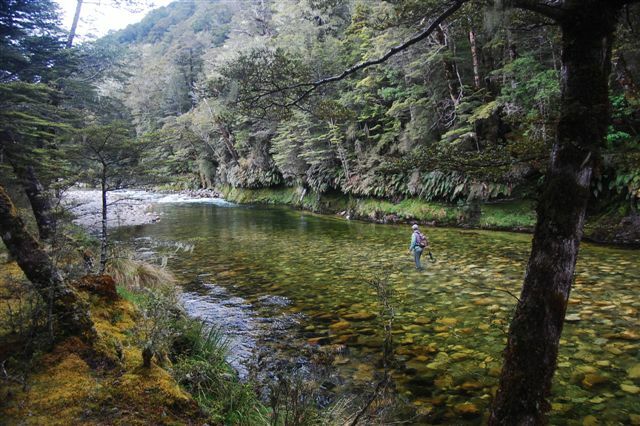 Our time together near Fiordland was the stuff of fly fishing fantasies, albeit a little wet. This region receives an astonishing 200-plus inches of rain annually, making it one of the wettest places on earth. A short drive from Te Anau we found ourselves alone on a narrow, winding spring creek that looked like it was right out of a glossy New Zealand travel brochure. Wading quietly upstream, we spotted plenty of good fish nymphing in shallow gravel runs and rising quietly under overhanging willows or tight to wood. Lawton’s keen eyes — even without decent light — and gentle encouragement helped me to catch more than my share of the hefty, sea-run browns that inhabited this special piece of water. Towards day’s end, we were both soaked to the bone when Lawton suggested we check out a feeder creek that looked too small to hold anything, much less a Kiwi-size trout. To only my surprise, hidden in a shallow pocket under the cover of thick willows was a nice fish rising steadily in the rain. This was a textbook New Zealand fishing opportunity and I made what was sure to be my one and only cast, aiming short so as not to get hung up. 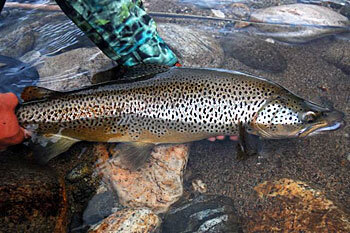 The big brown sensed my dry immediately, swung around and ate — just like in my dreams. Gear up! While a fast-action, graphite 5-weight is perfectly adequate for making stealthy presentations on most Kiwi rivers, these days I also carry a 6-weight rod in my arsenal if only to better combat the challenge of casting larger dries like Cicadas and weighted nymphs on long leaders in windy conditions. Got backing? While double-digit trout don’t happen every day down under, the possibility of a fish of a lifetime should make you reconsider if your current trout reel is up to the task. Do yourself a favor and invest in a high quality, large-arbor reel with a smooth drag and plenty of backing capacity before making your trip. Stealth wins the day. 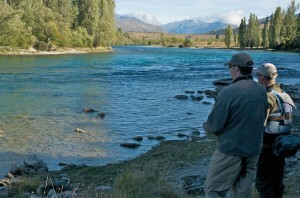 Don’t even think about showing up to fish with a Kiwi guide with a brightly colored fly line. Leave your No-Hackles at home. While we all like to carry tons of flies in our vest, New Zealand fly selection is very basic, if not “old-school,” and presentation is the real key. I recommend getting what you need from the local experts and saving yourself the hassle.